Nashville Car Accident FAQ | Raybin & Weissman, P.C. Suffering an injury after you’ve been involved in an auto wreck is something you simply can’t prepare for. With this in mind, we have addressed some of the questions we are most commonly asked regarding car accident claims in Nashville. If you have further questions, or if your question wasn’t answered below, contact our firm as soon as possible to discuss the individual details of your auto crash. If I am partially responsible for the cause of the accident, do I still have a case? It depends on how much blame you carry for the cause of the accident. Tennessee operates under modified comparative negligence, so even if you are partially at fault, you may still be able to pursue compensation for your damages. However, the threshold is 49 percent, so if you are found to be 50 percent liable or more, you’ll no longer be able to pursue a civil claim. Will my case be settled in court? It’s possible. If we can negotiate with the insurance company to obtain the compensation you deserve, then your case won’t have to go to court. However, chances are that the insurance company isn’t going to be willing to settle your case for a fair amount, so we may need to bring your case to court in order to get the most out of your claim. How long do I have to file my car crash claim? You will have one year from the date of the car accident to get your claim filed. If you weren’t diagnosed with an injury caused by the accident until a later date, then the one-year statute of limitations will begin running from the date of your diagnosis. Should I tell the insurance adjuster how the accident happened? Absolutely not. The insurer typically isn’t on your side in these types of situations. Sure, it may seem as though they are looking out for your best interests, but the fact of the matter is that paying out on your claim isn’t to their benefit. Any communications with the insurance company should be handled by your Nashville car accident attorney so you aren’t taken advantage of. The claims process in Nashville can be far more challenging than you might be ready to handle, and working with an attorney could be the best way to protect yourself. 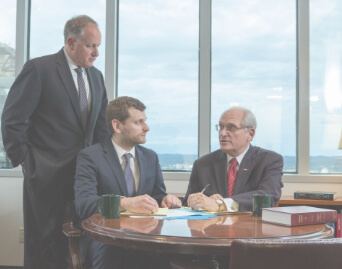 Schedule your free case review with a regarded Nashville car accident lawyer at Raybin & Weissman, P.C. today by filling out the brief contact form below or by giving our office a call at 615-256-6666.